A wannabe rock star, I play bass guitar. 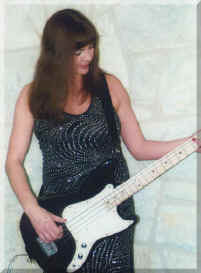 One of the few girl students of electric guitar in the 1970s, I offer classes in lyrics and songwriting - MUSIC FROM THE HEART: WRITING FEARLESS LYRICS. His hair a pure white. the man stopped to pray. and shake his brave hand. to keep this free land. and how free isn't free. He wished he was dead. He fought the Gulf War. and he spoke of his pain. on a sad awful day. My Dad's a Korean War Army veteran, and I like writing patriotic songs. who lives in a New York fire station. Patch never asks for a vacation. as Patch was napping in her favorite chair. The chief said, "Patch, take a break . . . just stay there,"
And then he whispered a quick Lord's Prayer. as she labored in birth with Puppy Number Five. was the lesson Patch learned. I spin like the stripes on a barber's pole. in my dark broken heart. yank out the brown weeds. Bring on the love beads. NEWS FLASH! Donna and Linda have signed a song publishing contract for their song "Empty Chair." For the best guitar straps (girls & guys! ), check out Action Custom Straps!